Little Baguio Terraces is impressive as well for the many ways it enhances city living. 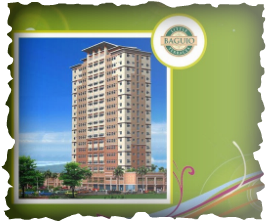 Undoubtedly, its pride is its two-bedroom condominium homes that come in a choice of two layouts. For large families, two units may be combined to give a floor area of up to 60 square meters For residents with outdoor pursuits in mind, Clusters 3 and 5 offer a landscaped hideaway with benches, a swimming pool and sunbathing lounge, children's pool, spa and playground. At the first level of the clusters are indoor facilities including a gym, Laundromat and day care center. Two car-and-pedestrian bridges at the mezzanine level connects Clusters 1, 3 and 5 to Clusters 2, 4 and 6. From inside the community, residents can reach Aurora Boulevard or N. Domingo St via an exclusive, 177-meter access road. Two elevators are provided for each cluster, or a total of 12 elevators for the entire community. *At the first level of the clusters are indoor facilities including Laundromat and day care center.